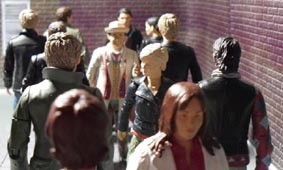 The street scene uses various Primeval figures including Jenny, Cutter, Lester, Steven and the two versions of Connor. There's also a custom version of Cutter's head on Lester's body and Helen on Jenny's body. Those customs appear in the Cabinet along side Lester proper and the Master. The JNT style monster cameos feature the Zygon, Sea Devil, Auton, Earthshock Cyberman and Imperial Dalek. The Ganglia are a rubber jelly fish, photoshopped. It had originally been hoped that this one off 7th Doctor would be posted with the AFT update on 23 March but the figure didn't arrive until then. It was posted on 3rd April instead. Since the seventh Doctor was first announced way back in early 2008, I've been planning a short AFT arc for him but it really requires a less jokey looking Doctor and so have been held off until the rumoured 'serious head' version is released. 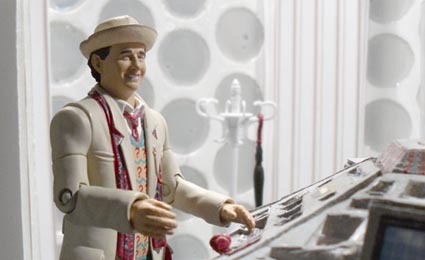 The smiley version is very indicative of the fun side of the seventh Doctor, a side often forgotten as we tend to think of the seventh Doctor as the dark, arch manipulator he was becoming and certainly became in the New Adventures books of the 90s. In lieu of the proper AFT seventh Doctor series, Grey Matter is a one-shot aimed at getting this under used Doctor on the site. The original title was Beautiful Dreamer but that pretty much gave away the plot far too early. 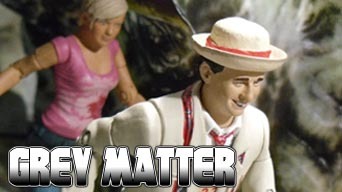 Grey Matter, while referring to the brain-like Thalamus is reminiscent of the working title to the 7th Doctor's opening adventure, Strange Matter. Thalamus was originally called 'The Synapse' and the Ganglia were called 'Neurons' but I decided to give them both names from the brain. Alison's name is Alison Hart- the name of GI Joe's Lady Jaye, a figure I used in the 80s as a companion for my Dapol 7th Doctor. Shooting began on 23 March and was completed in a couple of days. A couple of late pick up shots were done on 30th March of the cyberman and dalek for the cameo shot and of the Doctor dropping off the synaptic missile. Editing was completed on 31 March. 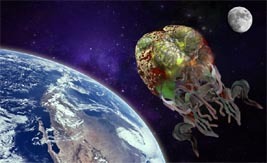 Thalamus was created using photoshop and is the combination of a jelly fish and a statue of a beetle, believe it or not. I wracked my brains to come up with a song for Alison to sing in the opening frame. It was going to be 'Reach for the stars' since the figure is essentially Hannah from S Club. Eventually though the Eurythmics Sweet Dreams seemed to be very appropriate. Even though the Doctor is far from being the galactic manipulator, he still has moments of seriousness where that smiley face just isn't appropriate. For a couple of frames I've totally altered the face, photoshopping in elements from erm... another image. This is set after the Doctor's travels with Ace but obviously before his regeneration in the TV Movie. How and why they have parted has yet to be established but it will be touched upon more as the seventh Doctor continues his adventures on the AFT.